Although the Occasions Mini Catalog won't come out until April, Stampin' Up! released a Sneak Peek featuring many Easter/Holiday sets! Get ready to make those Easter/Holiday cards! 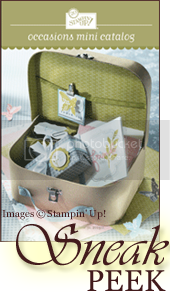 Click the image below to view the stamp sets as well as get some wonderful ideas! Below is a chart listing all the featured stamps set and pricing. We even have one of the sets in 3 languages - English, Spanish, and French! Retiring Accessories List - While Supplies Last! * This item is part of the INVENTORY BLOW OUT SALE! Buy for yourself or purchase these bundles as a gift for someone who loves to stamp! Don't miss this opportunity to save 20-50% on these bundles! You only have until Dec. 1st and only while supplies last! Click here or here to begin shopping online!